JewelryCandles recently revealed their sister candle company! Ring candles!! When you order, you choose the size of your ring! How awesome is that? You can choose from a size 5-10 ring. Each candle is 28.00 plus shipping. With fall approaching, I know you will love the pumpkin spice scent. 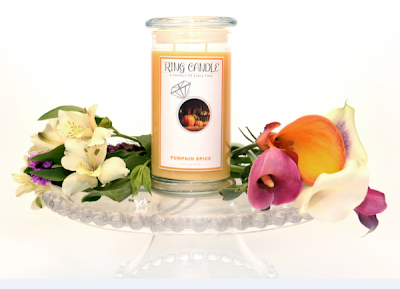 I am very lucky to be able to bring you an amazing Ring Candle giveaway! JewelryCandles is allowing me to giveaway a Pumpkin Spice Ring Candle to one lucky winner! Winner does get to pick their ring size! Starts 9/11/13 at 3 pm Mountain and ends 9/25/13 at 3 pm Mountain. Contestants must be within the U.S and 18 or older! Good Luck!!! Reviewz & Newz is not responsible for gift or shipping. I bet this candle smells wonderful!